On the morning of the last day for qualifying for the Nov. 6 elections, the field of challengers to U.S. Steve Scalise grew again to a total of five opponents, and the race for an open judicial seat in New Orleans got more crowded as well. 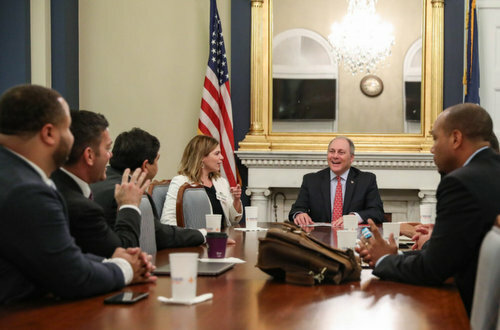 Scalise (R-Jefferson) filed his paperwork to run for re-election on Friday morning, and he drew two more challengers — Lee Ann Dugas (D-Kenner) and Frederick “Ferd” Jones (Independent-Hammond). They bring the total to five, after three others signed up to run on Wednesday. Two more candidates also qualified for the open judicial seat on Civil District Court, Kenneth Plaisance and Marie Williams. Two more Republicans joined the race for Secretary of State, Rick Edmonds of Baton Rouge and Thomas J. Kennedy III of Metairie. Finally, Richard Ducote (R-Covington), also qualified to run as a candidate for associate justice on the state Supreme Court. There is still time for a few more surprises on the ballot, as qualifying does not end until 4:30 p.m. today (Friday, July 20).